So here let me focus on NAS signally aspects of LTE. It is highly preferable to have some prior knowledge about any wireless technology : 2G, 3G or 4G. This LTE-NAS series will provide some idea about LTE basic procedures and signaling message exchanges. They are called NAS messages. One can always refer 3GPP standard to learn NAS. But here I wrote it differently, in my own wordings, at my blog 'Express YourSelf !' Enjoy it and let me know your feedback. Even UMTS has NAS. NAS messages are for (1) Mobility (2) Session Management and (3) Security. Security has two aspects: (1)integrity and (2)ciphering. Today’s article is about EMM. EMM includes determining UE's location, user's authentication, confidentiality, and connection management. Procedure is a group of NAS messages exchange with specific purpose. There are two kinds of EMM elementary procedures. (1) Common procedures and (2) specific procedures. Let’s see specific procedures, (1)Attach, (2)Detach and (3) TAU are EMM’s specific procedures. As the name suggest, UE invokes attach procedure to attach to LTE network and to detach from LTE network, the detach procedure. These procedures are invoked when UE is powered ON (attach) or OFF (detach). Also when UE enters to LTE coverage area (attach) or leave LTE coverage area (detach). Simple to understand. Is not it? Generally UE and network both are backward compatible. So UE may perform combined attach/detach for (1) new LTE network and (2) legacy GPRS/UMTS network. To support such combine procedure is optional. Normal attach and combined attach are differ only by presence of few optional IEs. There are three kinds of UEs. PS only mode UE works only with EPS (EPS is synonymous for LTE). These UEs are not mobile handsets but they are USB dongle or PC card. They never perform combined procedure. “CS/PS mode 1 UE” and “CS/PS mode 2 UE” are dual mode. If UE is under coverage of both LTE and legacy GPRS/UMTS, then Mode 1 UE prefers non-EPS (GPRS/UMTS) and mode 2 prefers EPS(LTE) service. However, they can attach to both networks, (1) EPS network and (2) non-EPS network. After knowing the purpose of EMM procedure, let’s have closer look to them. The EMM Specific procedures in turn may optionally invoke common procedures. For example, EMM specific procedure named Attach may invoke other EMM common procedure(s) like (1)GUTI relocation, (2)Authentication, (3)Security Mode control, (4)Identification, (5)EMM Information and (6)ESM Information. They are optional. 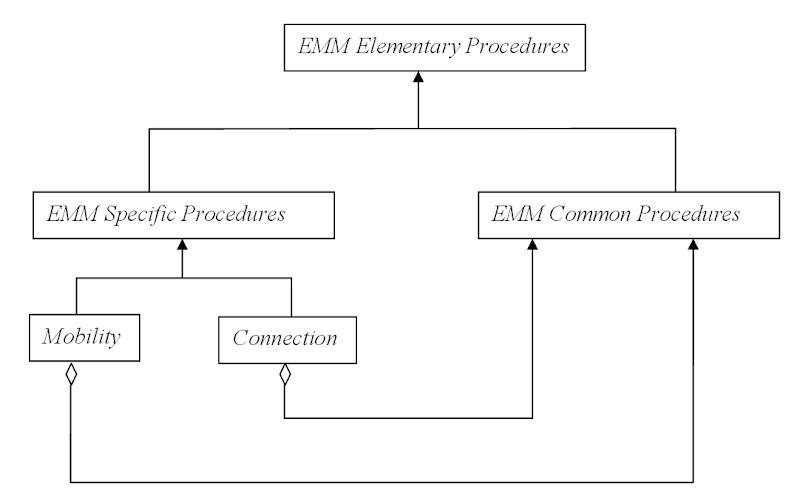 The common procedures and specific procedures, both are EMM elementary procedure. Let me describe this concept with a class diagram !! Yes, I know, we use UML class diagram for design a software module. Here I have used just to make the point clear. It is not for design of NAS module neither at UE nor at MME. Have you noticed? I used italic fonts in diagram to indicate abstract class They are still category only, not any concrete procedure. Here all EMM Specific procedures and few ECM specific procedures may optionally invoke EMM common procedure(s). So these specific procedures are “whole”, common procedure(s) are “part” and this is aggregation relationship. Also, if you observe carefully the class diagram looks like Composite design pattern. RRC carries NAS messages. In UMTS, RRC is terminating at RNC. LTE network, does not have RNC so RRC is terminating at eNB. NAS terminates at MME. NAS messages are between UE and MME. RRC and NAS both provides data integrity. Ciphering is mandatory for RRC, but optional for NAS. NAS can have at least two FSMs for (1) ESM FSM and (2) EMM FSM. EMM FSM has seven states. (1) EMM Null, (2) EMM DeRegistered, (3) EMM DeRegistered initiated, (4) EMM Registered, (5) EMM Registered initiated, (6) EMM TAU initiated, (7) EMM Service Request initiated. Have you noticed? Out of these seven states, most of them are transient states. EMM FSM has major two states only. EMM DeRegistered and EMM Registered. They are correspond to UE is power OFF and UE power ON (with valid subscription :-) ) respectively. ECM can have its FSM. For EMM Registered state, ECM FSM has two states. (1) ECM idle and (2) ECM connected. They are also known as EMM Idle and EMM Connected respectively.